investing or trading in metals, you need authoritative information and proven investment strategies. 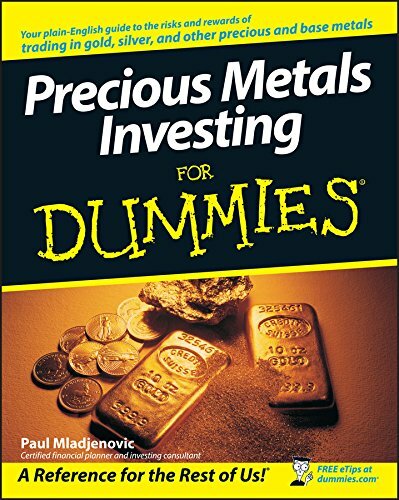 You need Precious Metal Investing For Dummies. This straightforward guide eases you into the precious metals market with sound advice on trading and owning these profitable investments, including gold, silver, platinum, and uranium, as well as high-demand base metals such as zinc and copper. You’ll learn how to research their market performance and choose among an array of proven trading plans and strategies. Plus, you’ll get savvy advice on how to choose a broker, buy stocks and futures that involve metals, maximize your investment return, and minimize your risk. Discover how to: Evaluate the different metals Add metals to your portfolio Decide whether you’re an investor or a trader Identify your metal-investment goals Weigh the risks and benefits of metals investing Buy physical metals Use technical analysis to evaluate opportunities Make long-term investments in precious metals Diversify your metals investments Analyze base-metals companies Purchase numismatic coins Add metals to your mutual fund or ETF portfolio Understand how politics effects metals prices Metals can be an important and valuable addition to any investment portfolio or retirement plan. Make the most out of your investment with Precious Metal Investing For Dummies.